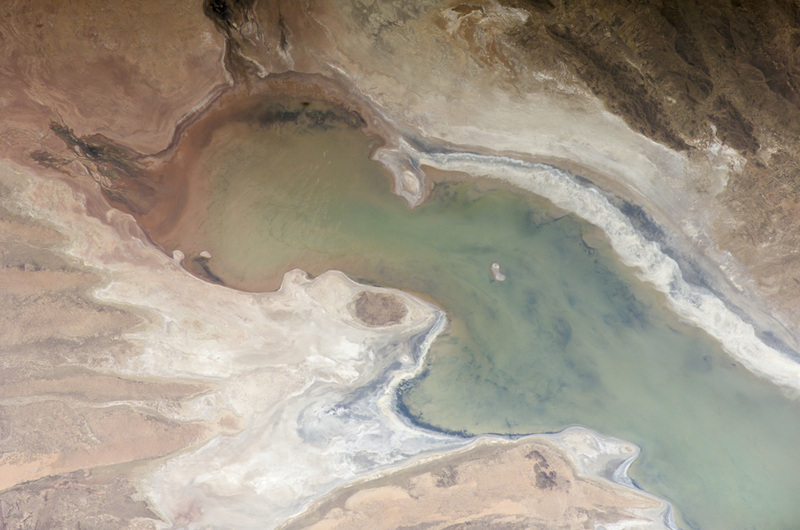 Lake Poopó sits high in the Bolivian Andes, catching runoff from its larger neighbor to the north—Lake Titicaca (not shown)—by way of the Desaguadero River, which is the muddy area at the north end of the lake. Because Lake Poopó is very high in elevation (roughly 3,400 meters, or 11,000 feet above sea level), very shallow (generally less than 3 meters, or 9 feet), and the regional climate is very dry, small changes in precipitation in the surrounding basin have large impacts on the water levels and area of Lake Poopó. When the lake fills during wet periods, it drains from the south end into the Salar de Coipasa salt flat (not shown). Water levels in Lake Poopó are important because the lake is one of South America’s largest salt-water lakes, making it a prime stop for migratory birds, including flamingoes. The lake has been designated as a RAMSAR site. These photographs were taken in November 2005 (whole lake) and March 2006 (detail) by the Expedition 12 crew of the International Space Station. 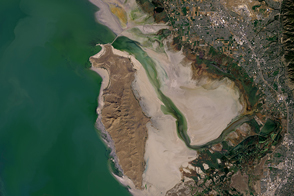 In November, water levels had dropped, exposing large tracts of salt and mud flats. A wet and cool period between December 2005 and the end of February 2006 resulted in flooding of Poopó with muddy waters from the Desaguadero River. The area of the March 9 photograph is indicated on the November 3 mosaic by a white polygon. 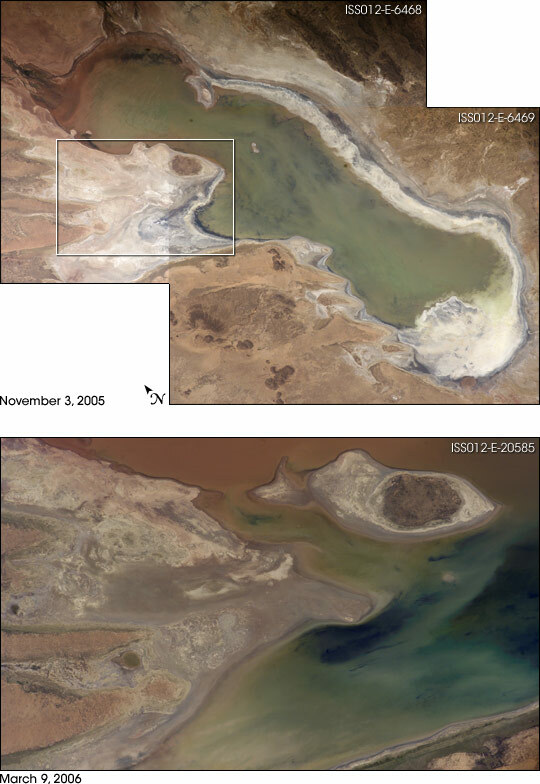 Comparison of the photographs shows the extent of flooding of the western salt flats—sufficient to create an ephemeral island. The ISS crew is tasked to track such changes, which are related to regional weather patterns. Lake Poopó’s sensitivity to precipitation in the high Andes (possibly reflecting larger climate cycles) provides an excellent visual indicator of weather and climate trends. Astronaut photographs ISS012-E-6468, ISS012-E-6469 were acquired November 3, 2005, with a Kodak 760C digital camera using a 180 mm lens. Astronaut photographs ISS012-E-20585 and ISS012-E-20586 were acquired March 9, 2006, with a Kodak 760C digital camera using a 400 mm lens. All images are provided by the ISS Crew Earth Observations experiment and the Image Science & Analysis Group, Johnson Space Center. The images in this article have been cropped and enhanced to improve contrast. The International Space Station Program supports the laboratory to help astronauts take pictures of Earth that will be of the greatest value to scientists and the public, and to make those images freely available on the Internet. Additional images taken by astronauts and cosmonauts can be viewed at the NASA/JSC Gateway to Astronaut Photography of Earth. 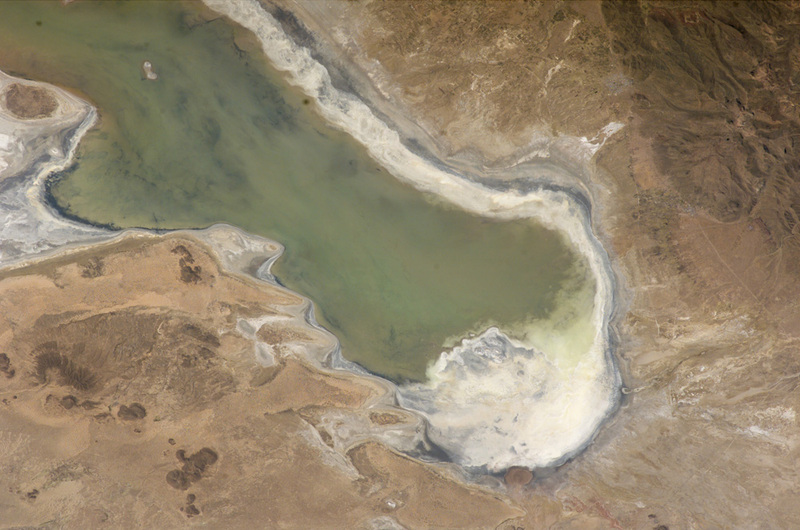 Lake Poopó sits high in the Bolivian Andes, catching runoff from its larger neighbor to the north—Lake Titicaca (not shown)—by way of the Desaguadero River, which is the muddy area at the north end of the lake. Because Lake Poopó is very high in elevation (roughly 3,400 meters, or 11,000 feet above sea level), very shallow (generally less than 3 meters, or 9 feet), and the regional climate is very dry, small changes in precipitation in the surrounding basin have large impacts on the water levels and area of Lake Poopó. 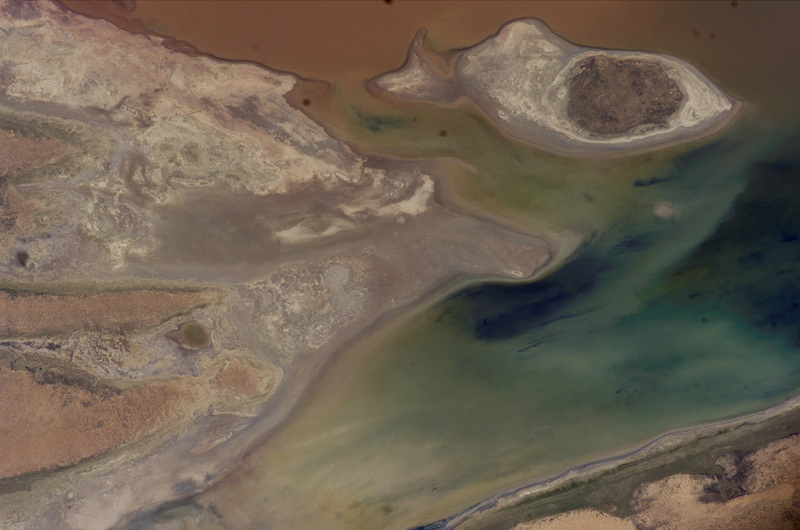 When the lake fills during wet periods, it drains from the south end into the Salar de Coipasa salt flat (not shown). Water levels in Lake Poopó are important because the lake is one of South America’s largest salt-water lakes, making it a prime stop for migratory birds, including flamingoes.